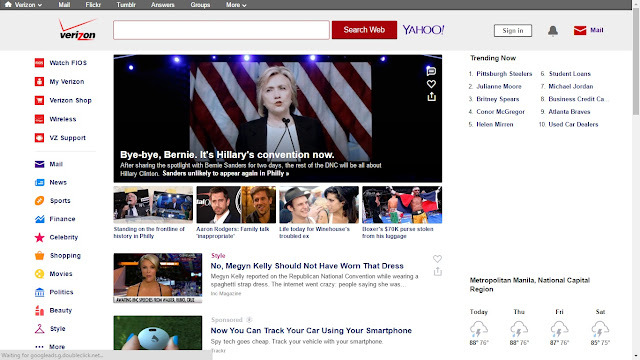 Verizon has bought Yahoo! for US$4.8 billion. Should we be bothered? In what is dubbed as the "saddest US$5 [actually US$4.8] billion deal in tech history," the core assets of Yahoo!, Inc. (once an internet giant before Google and Facebook took over; and also the place where most Filipinos signed up for email) has been sold to the biggest wireless telco in the U.S., Verizon. Now what happens after this? First, let's describe the assets that are sold to: Yahoo! 's email, sports, news, finance, real estate and advertising tools aside from some patents. Let's put a big emphasis on email: Coming back from what we said earlier, most of us (if not all) have Yahoo! email addresses. Now that a major US telco will soon own Yahoo! Mail and Yahoo! Finance, should we be bothered? Not at all. In the words of Forbes' Brian Solomon, "It’s an ironic end. While the opening of the consumer web made the portal an early online superpower, now Yahoo will be eaten by a company that enables more users to access the Internet every day, from anywhere, than Yahoo’s founders [Jerry Yang and David Filo] ever could have dreamed when they first launched." Moreover, Solomon also mentioned that Yahoo! will be reunited with another then-giant, America Online (AOL). Yahoo! and AOL were the big ones in content, and not to mention AOL's assets include websites catering to news and tech which has a big following. While the present time of Yahoo! is definitely turbulent - shout-out to that deal they had with Tumblr - some are optimistic that the deal will bring life back to it. Maybe this will be the next thing that people will remember in the future, after the search engine and the Yahoo! yodel. Who knows?